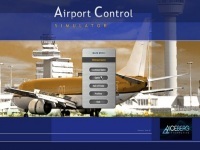 In the game: Airport Control Simulator, you will be facing challenges to manage planes that are going to land on the airport. Pay attention to collisions and lack of fuel. Fuel of airplanes approaching to an airport is becoming less and less. While there are some other planes standing in line. The distance among the planes must be far enough to prevent collision. That's all you have to take care to grab a win in this game. Make sure all the planes can land safely. This game introduces error points. It is the point that a player gets when the distance between planes are very close and if a plane is flying across the runway. When your error points are more than zero, you can't unlock other airports. So make sure to avoid it. Parameters must be paid attention in this game include: plane's speed, altitude, fuel, right runway, and gap between planes. When you can do those things right, you're going to be promoted to work on more demanding airports. This game is bloody amazing game. Play car racing game with 42 different cars, 30 tracks and more than 50 opponents.